Ok this is entirely too good to just ignore. I read it first on Wil Wheaton's blog, then over at Dvorak Uncensored and now I bring it to you. A student has been suspended for doing nothing more than acting in accordance with his religious beliefs. You know it would be easy to take the cheap road and make jokes at the poor lads expense, it would even be easy to make fun of the fine religion of Pastafarianism but I would never do anything like that. I have a healthy fear of The Flying Spaghetti Monster. Just before posting this I also noticed that the article made it to Digg. Not surprising at all, but still worth mentioning. 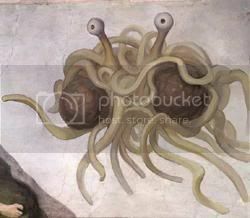 For further reading you can also check out The Flying Spaghetti Monster's Wikipedia entry. If you are anything like me you will agree that it is definitely worth checking out. 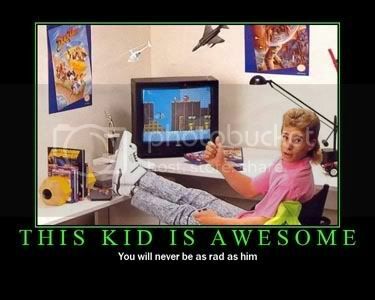 Within the first three and a half minutes(of the first episode which was just released) alone they touched on a lot of things that were probably too much a part of my time growing up.... Man the 80's and early 90's were awesome*. *Even if they weren't, that is when I grew up which gives me the right to spin falsehoods about the that particular time frame. Though there are some snags along the way this movie surprised me and I found it completely enjoyable. In place of the nonsensical punch fest that I was expecting I found an engaging, emotional (and dare I say nearly sweet?) story of a man nearly broken, angry, and depressed finding a way to literally and figuratively fight back against his own inner demons and a world that seems intent on dragging him down. Emotion seems to be the word of the day, which is good because pretty much the entire first half of the movie is all about emotion. 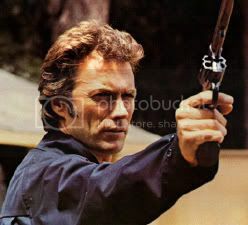 There is very little in the way of action, it is all about the characters. 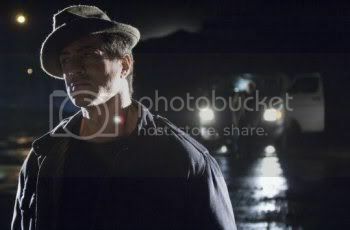 From Rocky and Paulie having two different reactions to a memory laden trip through Philadelphia on the anniversary of Adrian's death, to Rocky dealing with an ultimately unfulfillable job while Paulie deals with the loss of his, to Robbie Jr. having issues living under the shadow cast by the name Balboa. There is a lot of emotion to process, and I didn't even cover half of it, just the early stuff. Of course as the previews for the movie told us. A cable sports show conducts a computer generated fight between Rocky and the current champ Mason “The Line” Dixon(OK I admit something when horribly wacky with that name) which has Rock take the win. This leads to Rocky getting the idea to train again and eventually try for a few small fights, you know “just to compete”. While all of that is playing out the boxing world is having a tough time. Dixon is extremely unpopular with the fans(seriously, they throw things at him and everything) and the buy rates are going down. That is when his managers realize that a Balboa/Dixon exhibition might just stir up some much needed attention. Guess what this leads to, MONTAGE! ...But in a good way. Even though training is underway there are still plenty of obstacles to get past before the big fight. By the time Dixon and Rocky actually make it into the ring with each other you are connected and almost need this fight to happen as badly as Rocky. I don't want to ruin anything else here but I can say this, the fight is everything that it needs to be and then some. I was particularly impressed with the way that Stallone's performance. The simpleness (notice I didn't say unintelligent, I believe he is quite smart in his own perhaps unconventional way) in Rocky if played incorrectly could sway from endearing to offensive very easily. I also want to mention a bit from the extras, an extended version of the scene after Paulie loses his job, behind the restaurant Rocky and him have a talk. In the deleted parts of the scene Paulie has such an amazing emotional(there is that word again!) breakdown that I don't even think I can describe it. Just very intense and at times a little difficult to watch. In the end the extended version does go on a little longer than I would like, but after watching it I definitely have to give my respect to Burt Young. On the flip side of what I have been saying there were a few small things that were a bit annoying. At times it does feel like you are being emotionally lead around. Also a lot of the problems that Rocky runs into seem to be solved in a similar manner (lets face it, an emotional speech is a great thing for a movie to have, but would it really be able to sway an athletic commissions decision? Yeah I don't think so either.). The only other main issue I had that comes to mind immediately is the second montage aka the final fight. There was a little bit of everything thrown into that fight, by that I mean effect wise there was just something of everything. Replays, slow motion, black and white effects, crazy cutting and fading, pretty much everything short of rotoscoping. It all seemed a bit much. In case I haven't made it painfully clear yet. My recommendation is, if you haven't done so already already. 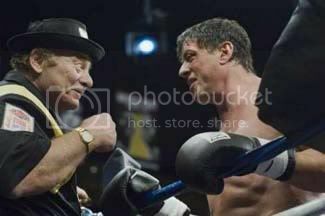 Seek out Rocky Balboa and give it a chance, you just may enjoy yourself. Here I sit punishing myself for having what I consider a nearly crippling case of writers block. The block is nothing new to me, I have been completely out of practice for so long that it doesn't seem like I will ever be able to let the words fly free again. The new part is the punishment. You see I have sitting right here right now Rocky Balboa, Infernal Affairs, Raising Arizona, and The Big Lebowski. They are just sitting and nothing else, not until I can come up with something... anything that doesn't look as if it has been written by a room full of monkeys that are jacked up on Mountain Dew and speed. Apparently though I am tapped as the best I could come up with is writing something about how I can't come up with anything to write about. Whats up with that? How about a friendly little list. Things that won't cure writer's block...a.k.a. Things likely to distract you, for better or for worse. Last.fm Once you have gone through enough songs for it to make a decent recommendation station for you this is a really nice site. I did notice that when I get frustrated I end up skipping songs I don't know a little more often than I should, if I can break that habit I think I'll be better off. I used to listen to Launchcast a lot back when I had an ISP that allowed me the commercial free service. Commercials get too boring. It figures I would start getting back into Internet radio when it looks as if it is in trouble. This weeks ep of WatS is very distracting, in a good way. The guest was/is the incredible Mr. Gary Owens. Mr. Owens has to be one of the most likable human beings in existence. Let's not forget he also happens to be a living legend. Due to his many many vocal credits I can pretty much guarantee that between the ages of lets say 6 or 7 and 14 I heard his voice on a near daily basis. If one extremely nice and talented guest on the show isn't enough to get your attention what would you say if I mentioned that the always fun Fritz Coleman dropped in on the show as well? Particle Man by They Might Be Giants will stop you dead and force you to simultaneously rock and geek out. Well if you are like me it will anyway. Very very distracting! I'm going to go ahead and blame Wil Wheaton for this one. In fact I think I may blame him for my entire Last.fm experiment. The title of the song Particle Man reminds me of a sketch Conan O'Brien did a few years back on SNL. Going through eight movies in about two and a half days may sound like an awesome idea, but I don't think I can fully endorse it as a regular behavior. Stagger your marathons or at least conduct them with care. Don't worry, when I did it over the weekend I did manage to find a little time in there to eat, sleep, shower, and even play a little Xbox Texas Hold'em. Of course by “sleep” I do mean that I passed out in the middle of a hand during the Texas Hold'em and woke up an hour and a half later with a stiff neck and a pair of threes. By the way, this will be the first time that I will be simulposting my thoughts here as well as over at the so far Untitled Review Repository. Basically I put the new place together to keep my reviews and thoughts on things (mostly movies) accessible without having to subject yourself to my random personal postings. Now on with the show we go. I was tempted to not say a word on this one until after I had a chance to watch Infernal Affairs but I find myself unable or at least unwilling to keep quiet. The first thing you will probably notice here is the cast, Scorsese really managed to bring them out for this one. Jack Nicholson really seemed to be having fun with this role, he found a way to be both likable (possibly even lovable) and vile almost at times in the same breath. Mark Wahlberg also found a way to impress me with his performance. He didn't get a ton of screen time here but what he did get he made count. Seriously, the man basically turned swearing into an art form. Those are just a couple of small examples, the rest of the cast (Matt Damon, Leonardo DiCaprion, Martin Sheen, Alec Baldwin, Vera Farmiga) also performed to excellence. They all even managed to pull off two and a half straight hours of Boston accents without it becoming some sort of scary farce of itself (trust me, there was a compliment hidden in there somewhere). So an overly simplified plot explanation could go something like... 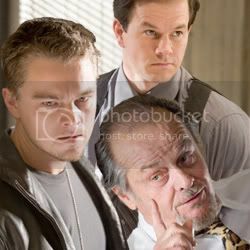 The Irish Mafia (or at a branch of it led by Jack Nicholson) sneaks a mole (Matt Damon) into the Massachusetts state police while at the same time the cops recruit their own mole (Leonardo DiCaprio) to infiltrate the Irish Mafia. Eventually both sides start wising up to the fact that they are compromised and the race is on to see who can discover who first. Along the way there is no shortage of violence, bloodshed, romance, friendship, betrayal, confusion, oh yes and some (more) violence. This movie really reminded me to never underestimate the power of a surprise death. Also worth noting briefly is that this movie I believe solidifies for me that DiCaprio has finally shaken off most of the stink brought forth by Titanic. Congrats Leo, I look forward to not openly mocking you in all of your future endeavors! It sure has been a crazy time between very late Friday and very early Monday. By crazy of course I mean me in the head must be crazy, but that is another story for another time. For now I'll just quickly do a head count to show where my time went over the last few days. The Departed, The Evil Dead, The Proposition, Borat, Magnum Force, Battle Royale, The Evil Dead II: Dead By Dawn, and Baby Doll. That is a respectable if not tiring amount of movies. There shall be more to come as soon as my brain unscrambles. I have some opinions on most of what I have watched but under ideal circumstances I feel that my writing style can be incoherent and unsettling. I would hate to see what damage I could do to the English language at present. And now a youtube video that has no ties to anything I have written in this post whatsoever. So it is 4 am and I find myself unable to find sleep so far. I was getting a bit tired of just laying in the dark cursing existence and praying for unconsciousness so I thought I would do an extremely quick update on my movie weekend progress thus far. I actually made it through a fair amount of movies for one day I think. I got through; The Proposition, Magnum Force, Borat, plus we can't forget the one I watched prior to the original post The Evil Dead. I'm saving the heavy hitters for after I wake up. 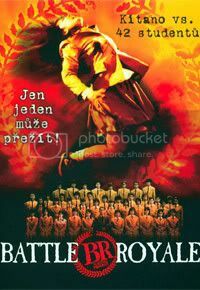 Battle Royale, and Baby Doll are at present the top of the list, after them the priority will be Evil Dead II as I want to see if I still prefer the original to the sequel or if my taste has changed/matured. I also found time in between movies to order myself a birthday present. Actually three of them, all books. I pre-ordered the final Harry Potter book. I also ordered a Kathy Reichs book (Fatal Voyage), and a book that contains; Bram Stoker's Dracula, Marry Shelly's Frankenstein, and Robert Louis Stevenson's Dr. Jekyll and Mr. Hyde. All in all not a bad take for under 30 dollars I think. You'll have to excuse the lack of links and interesting content in this post, it is late and my brain not work so splendid at this time of night. I've never been a huge fan of birthdays, mine especially. Some are good, most are bad. In the end it pretty much just chalks up to another day, right? My birthday happens to be tomorrow (Sunday). Normally the only thing truly different that would happen on that day for me is random people thinking it is ok to accost me with song. I'm changing things up this year. I am declaring this a time of “Leave me alone and let me watch and enjoy movies all weekend”. No wait, not you. Never you, I meant the other people. The stress inducers. I made this decision basically because the last couple of weeks have been pretty much hectic and stressful. Hey a guys gotta unwind somehow right? Actually I have a few reasons for making this a multi movie weekend. I am way behind on watching stuff, I have a pile of them I keep meaning to watch but never seem to be able to. Also I am running out of things to write about so I decided if I can get a couple of decent flicks under my belt I an bust out another abridged movie review or two(aren't you excited?). Plus like I mentioned above, I could really use the relaxation time. If I was a partier I would go out and have fun, but crowds frighten me and people might be carrying germs. I actually kicked the weekend off late last night with The Departed which I really enjoyed. Then this morning I watched The Evil Dead. Also on the (tentative) itinerary are The Proposition, Battle Royale, Baby Doll, Magnum Force, The Evil Dead II: Dead By Dawn, Borat, Traffic, and The Black Dahlia, and possibly (if I can get my hands on it) Infernal Affairs. Now I highly doubt I will get to every single movie on this list in just about a day and a half... not until I can get that damn Flux Capacitor working again. But I am going to try to go through as many as possible. My only non movie related plan for the weekend is to pay a visit to the Weezy and the Swish chat tonight during the show. It looks like the show/chat won't be until tomorrow, so my plans change accordingly. On the plus side the guest on the show is set to be Gary Owens. I plan on trying to ask a Blue Falcon related question. I am not sure how well my plans are going to work, but I did come up with a short list of possible outcomes. 1: I end up having an awesome weekend as I exit the halfway mark of my twenties and head into the “closer to 30” demographic. 2: Catastrophic failure of everything resulting in not only my death but an explosion rendering a least one third of the planet uninhabitable for a good hundred years. 9: The resurrection of the dead. 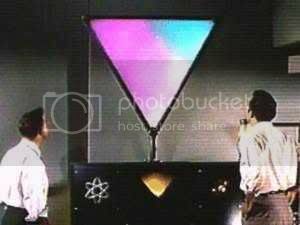 ... Now if you will excuse me I must go warm up my Interociter and start up the movies. P.S. In case you were wondering I do not really like cake all that much, instead I like to celebrate with a nice birthday pie. Usually lemon or chocolate, but never ever pumpkin! I wonder if you could get 26 candles on a pie and light them before they fall? Anyone who knows me can probably tell you that I could be considered a Browncoat. I may not be as active a one as I could be, but the fact is I do consider myself part of the group. Another bit of common knowledge about me is that I hail from the (great?) state of Oregon. What do these two tidbits of info have to do with each other? I'm glad you asked. The Portland Browncoats have announced this years charity screenings of Serenity for June 22, and 23 at the Hollywood theater (in Portland). This year in addition to Equality Now (Joss Whedon's charity of choice) a portion of the proceeds will also go to the Women's Film Initiative. I really shouldn't have to say how undeniably cool it is that so much good can come from a short lived but amazingly brilliant television show and it's subsequent movie continuation. If I were to find myself back home visiting on those days I would most definitely be in attendance. Knowing me I would probably show up on both days. Remember, these charity showings happen all over the place, but Portland is near and dear to me...much as I hate to admit it. Did you heed my words? I sure hope you did, if not you really did cheat yourself. In case you aren't sure what I am talking about (and you didn't click my handy link in the first paragraph) over the last weekend (March 10, 11) my favorite film critic (and a heck of a nice person I may add) Kim Morgan sat in for Roger Ebert on Ebert & Roeper. As a matter of fact as of this posting you can still watch the episode on the website. If you missed it when it aired I really do suggest you take the time and go to the site. So, onto my thoughts, as if they weren't apparent already. if only to further immortalize the phrase heard round the world(kind wish I could have come up with a better name for it(I also wish that I could stop using parentheses)). Also talked about on the show were The Namesake, Beyond the Gates, I Think I Love My Wife, The Host, and DVD picks Casino Royale and Baby Doll. Don't worry, I'm not going to rehash every review right here, but I think perhaps a few bullet points (not literal) may be in order. Kim knows her stuff, she knows it well. Anyone who is a regular reader of hers knows this. What you don't get to see in her writings is just how well she is able to articulate her thoughts aloud. Also in writing you don't see a lot of counterpointing going on but when those occasions came up she was more than able to back her opinions up. I got the feeling at times that Roeper himself knew that he was being outdone, let me clarify I am not a Richard Roeper hater the man has a job and he does it the way they hired him to do it(otherwise why would it still be his job right?). That being said it seemed like when he disagreed with Kim on some points (The Host and The Namesake come to mind immediately) he wasn't shy about trying to overpower and bully his opinion even going as far as to cut her off or talk over her. To her credit as I said Kim did not back down and she made her points. More bonus points to Kim for referring to Louis C.K. as great. Another thing I noticed, Kim Morgan.. apparently a hand talker. Not a bad thing, just an observation. If anything about the whole production disappointed me(other than my little nitpick about the bullying/cutoffs) it has to be the time set aside to talk about DVD picks. Yes I know that “Casino Royale” is new to DVD and probably more attractive to the general people at home but come on don't we all know by now what the movie is about and that it is good? On the other hand you have Kim's pick “Baby Doll” a movie that I wasn't familiar with before this week, one that I would have liked to hear a bit more about on the show. Though to be honest I don't need to hear exactly what made the movie great. Kim recommended it and that is good enough for me. Which of course means that it is on its way to my mailbox even as I type this. Ok one last point I promise. What was that awesome idea that Roeper said in passing? A Kim Morgan Film Fest... Count me in! Ok everyone here is the deal, this weekend you WILL be watching Ebert and Roeper. why you ask? The answer is simple, under normal circumstances the show is awesome and worth watching but this week I lay down my personal guarantee that it will be nothing short of phenomenal. You see this week the guest critic is none other than Kim Morgan!. Yes the very same Kim Morgan that I had a little something to say about a while back. Some time has passed since that post and I tell you I still count that as one of the most true statements I have ever made. Kim is incredibly talented, insightful, and engaging. Reading her writings and reviews you really feel her passion and personality flowing through her words. You really owe it to yourself to check the show out this weekend, I promise you will not be disappointed. Again I would like to say congratulations Kim! you know I'll be watching. Well I finally got to watch a full movie on HD DVD. Was there ever any doubt that it would be Serenity? 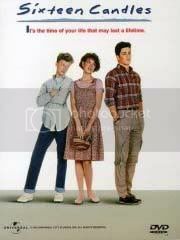 Astute readers will note that the quote from earlier is from this movie. For the record, when the Special Edition DVD is released I will be purchasing. For a cheapskate like me double buying a movie is a very very rare thing. "They'll come at you sideways. It's how they think. It's how they move. Sidle up and smile. Hit you where you're weak. Sort of man they're like to send believes hard. Kills and never asks why." Not much to say at the moment. I am currently babysitting/house sitting for a friend while he and his wife (also a friend) are at the hospital possibly having a baby. That means of course during the late hours I have some free time (hopefully) and some quiet (again hopefully). What have I decided to do with the time? Some small updating on MySpace mainly. During the updating I was forced (by myself, I can be a pretty harsh if put in a position of management... even with myself) to upload a picture of Tuesday Weld. After uploading and putting on my profile I decided that one place is not quite enough to share such a picture and so I bring it here as well for your viewing pleasure. that is because last night I watched Are You Smarter Than A 5th Grader?. Surprisingly(to me at least) the answer was nowhere near as strong a yes as I would have hoped. It turns out that I am only smarter than a 5th grader about 85% of the time. Even that number is probably being generous. Let me know when Fox comes up with "Can you beat up a Kindergartner" I'm fairly sure that I wouldn't have much trouble winning on that show... Unless there is biting.